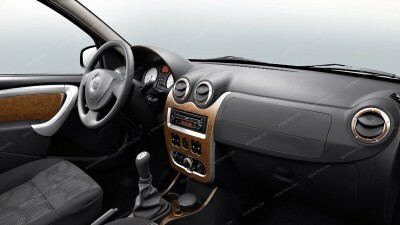 Use dash kits for Dacia from Wowtrim to enliven your the interior design of your car. Fix on the things you like out of real wood, wood grain, aluminum, camouflage & carbon fiber dash trim kits. We promise you will be fond of perfect quality, up-to-date colors and durable materials of our goods. Dacia Duster / Renault Duster 2010, 2011, 2012, With Manual Transmission, Full Interior Kit, 18 Pcs. Dacia Duster / Renault Duster 2010, 2011, 2012, With Manual Transmission, Basic Interior Kit, 14 Pcs. Dacia Logan 2004, 2005, 2006, 2007, 2008, Full Interior Kit, 21 Pcs. Dacia Logan/Sandero 2009, 2010, 2011, 2012, Renault Logan/Sandero 2009, 2010, 2011, 2012, Full Interior Kit, 17 Pcs. Dacia Logan 2004, 2005, 2006, 2007, 2008, Basic Interior Kit, 14 Pcs. Dacia Logan/Sandero 2009, 2010, 2011, 2012, Renault Logan/Sandero 2009, 2010, 2011, 2012, Basic Interior Kit, 12 Pcs.